Despite the fact that non-motorists have always been allowed on Montague, pedestrian/bicycle facilities --shoulders and sidewalks-- were eliminated at many locations as recently as 2003. Violations of BOS policy are in red. 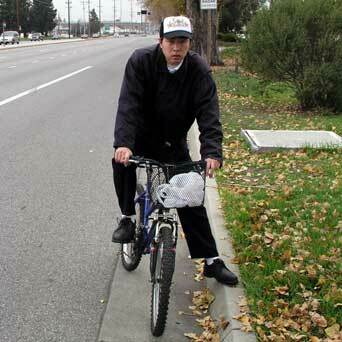 Photos of walkers in unsafe situations were taken in December 2004 because nothing was done for safety --and compliance with BOS policy-- since Mr. Michael Murdter, Director, Roads & Airports Department, County of Santa Clara, was shown photos of unsafe situations on Montague Expressway on November 10, 2004, and informed of these violations. 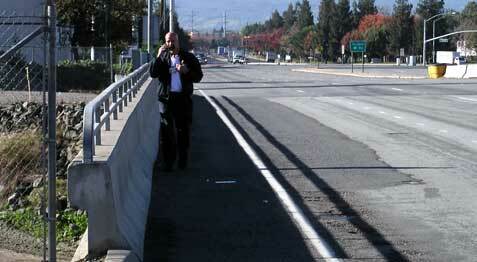 Restore the shoulder by eliminating the added acceleration lane: Montague at Milpitas Blvd. Walker above --not very noticeable-- uses the acceleration lane to go to Great Mall from Landess Avenue --the continuation of Montague. Walkers may not be seen by drivers concentrating on having to change lanes. The lane --13 feet wide-- does not even meet minimum width requirements for "sharing" --16 feet in the County Expressway Master Plan, approved by the Board of Supervisors (BOS). Moreover, acceleration lanes are not an approved intersection design by the County Expressway Master Plan. Acceleration lanes belong on freeways. They are not safe for "sharing" with walkers or bicyclists on arterial roads, which include "expressways." Most of this lane used to be a shoulder which I (Akos Szoboszlay) used as a bicycle commuter. Pickup turning right into the same acceleration lane --the drivers are often looking left or backwards trying to enter the next lane. Wrong-way bicyclist who works "nearby" rides against traffic in the acceleration lane. This is common here because there is no crossing for 1/3 mile. Restored shoulder --with new path at the corner-- would be used by bicyclists as well as walkers --the equivalent of riding on the sidewalk. The same acceleration lane: People walk and bicycle here even at night. It's unsafe, especially without lights which walkers don't have. It's even unsafe for motorists with lights, as shown by this rear-end accident. If the signal is red, most but not all cars just stop in the acceleration lane because merging can only occur during light traffic --not the daytime or commute norm. If the signal is green, they can take any lane and merging is not happening, either. It's not a freeway! Young lady at bus stop across the street --the "expressway"-- has to walk in the same acceleration lane to reach this bus stop. 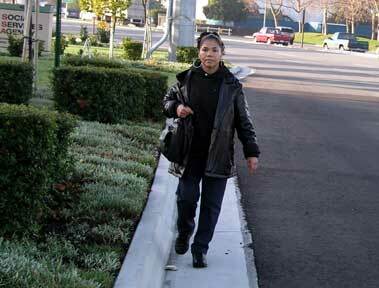 She commutes with her mother (who works on Montague), then continues by bus. 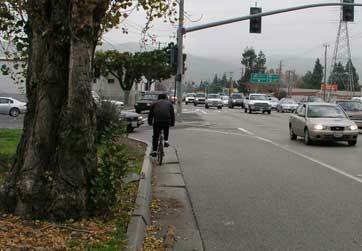 Acceleration lane history: Montague Expressway had pedestrian / bicycle facilities everywhere -- 8-foot shoulders like Foothill Expressway today -- until 1989 when County highway engineers started eliminating them for more traffic lanes --without creating alternatives --and continue eliminating them as recently as 2003. The most dangerous are acceleration lanes. In January 2004, at our request, Mr. Kutras, County Executive, forced the Department to change one such acceleration lane back to a shoulder.. There are two more, here and at Houret Dr., a dead-end street.. Trim the shrubbery and create a path: several locations just south of Capitol Ave. While one walker uses the wide shoulder --which is safe-- the other walker crosses the road midblock --considered most unsafe by traffic engineers-- because the alternative of using the crosswalk at the intersection is even more dangerous (see next photo) as a result of poor design by the Department. Walker (left) walks on the grass because she does not feel comfortable in the travel way next to the turning vehicle --nor should she! 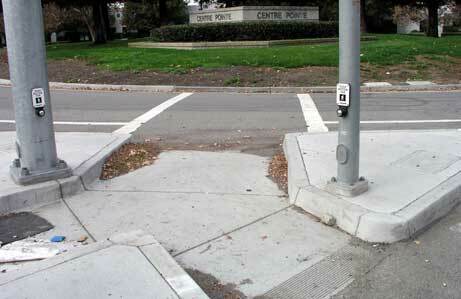 This is at a driveway --badly designed for both passing walkers and for those taking transit to work here. At many locations (such as at right), shrubs force use of the traffic lane. This right-turn lane is new. Yet, sidewalks were omitted, nor was a path created. This was despite the fact BOS policy states " ... so pedestrians do not have to enter the travel lane." Location is across the street from the "pork chop" (shown above). Consistently safe pedestrian travel along both sides of the road --Montague has always allowed walkers-- would be achieved by complying with BOS policy. Sidewalks destroyed! Montague at Coyote Creek crossing. 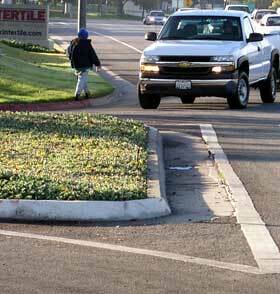 County highway engineers jack-hammered the sidewalks here in 1989 and narrowed the shoulder --used by bicyclists. 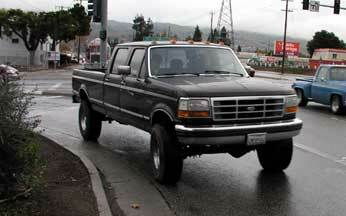 The shoulder now does not meet minimum 5-foot requirements of both BOS policy and San Jose City policy. The concrete wall necessitates an additional "setback" distance from the shoulder line --two more feet. While a sidewalk was rebuilt --years later-- on the other side of the road, 90% of walkers use this side because businesses are on this side in this block, and this side has access to Trimble Road and light rail. Even more walking traffic is expected here when the trail being constructed under the bridge --part of the Coyote River Oaks project-- is completed because "the project will include on-street connections and undercrossings at Montague Expressway ... "
For a complete list of eliminated or destroyed pedestrian and bicycle facilities on Montague Expressway, request or download the Excel spreadsheet. See more photos showing safety problems created: Montague Photo Gallery. Recent dangerous action near WP railroad crossing. Email from Deputy County Executive, and MTS rebuttal. What was Montague like when it had pedestrian / bicycle facilities everywhere? 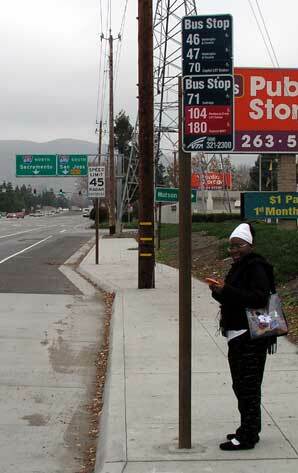 It was like Foothill Expressway today but without prohibitory signs. What more needs to be done on Montague? See the report.